Thousands line streets in protest at Coventry City groundshare plans. This afternoon, thousands of football fans united in protest at Coventry City’s plans to groundshare with Northampton Town at Sixfields for at least the next three seasons. Fans, not just of The Sky Blues turned out, as Birmingham City and Ipswich Town jerseys were spotted amongst others. The Sky Blue Trust organised the protest as a Keep Coventry in Coventry march as City fans will have a 70-mile round trip to watch home games should they go to ‘home’ games – however there were still a fair few ‘SISU OUT’ banners and signs visible. The protest comes after the Football League ratified Otium’s proposed plans to leave the Ricoh Arena and relocate to Sixfields in Northampton for at least three seasons, until a new stadium is built in the Coventry area. As such, as many as eleven City ‘home’ fixtures have already been, or will be rescheduled to Sunday afternoons or Wednesday evenings, as part of the agreement sees League Two side Northampton Town’s fixtures taking precedence for allocated kick off times and dates of Saturday and Tuesday respectively. In scenes reminiscent of 26 years ago, when the club famously defeated Tottenham Hotspur 3-2 to win The FA Cup, thousands of City fans turned the streets of the city sky blue and sang the Sky Blue song and other chants in unison. 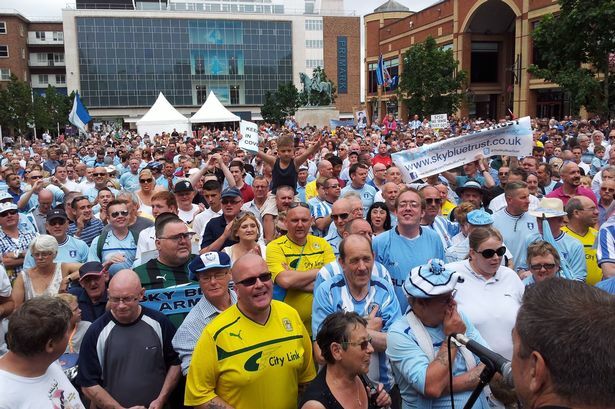 Jan Mokrzycki, spokesman for The Sky Blue Trust which had organised the march, said: “I’m absolutely delighted, it just shows you what passion there is for this football club and this city. “It’s a fantastic turnout and it’s a pleasure to be associated with it and I’m just proud of all the fans, they’ve been brilliantly behaved and we are getting our message over. “Coming up Gosford Street towards the Council House it does remind me of 1987, it’s that same mood. It’s a mood of defiance, it’s a mood of we love our club and we cannot understand why people want to take it away from this city. Search for the hashtag #KeepCovInCov on Twitter to see photos of the protest. « POLL: Would you go to Coventry City games if they cancelled groundshare & moved back to The Ricoh Arena?